Every business has (or should have) marketing personas for their users/customers. Whether it’s corporate customers vs small business, baby boomers vs newly weds, subscribers vs one-offs, we divide our audience into personas in order to market to them more effectively. We target our messages, hone our products and design our landing pages to suit the different audiences we cater to. Seeing how those different audiences behave on our site and react to our offers and information, can be invaluable marketing information. Google has previously allowed you to track lots of different customer personas in Google Analytics using Custom Segments, but now with Universal Analytics and Google Tag Manager it is easier than ever to set up. Custom Segments are now divided into Custom Dimensions and Custom Metrics. Since we’re looking at persona’s, we will be working with custom dimensions. By creating a custom dimension for your personas, you will be able to drill down into any analytics report that allows second dimensions to see behaviour by your personas. 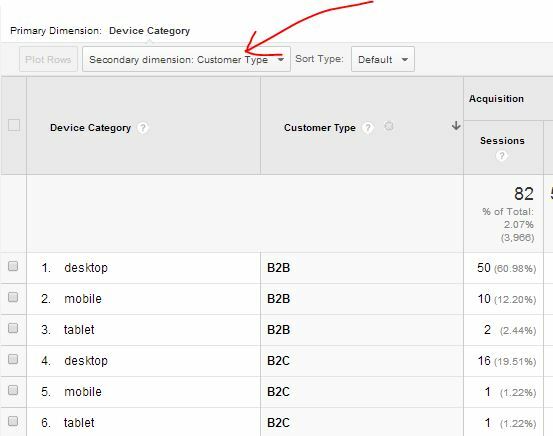 For example, if you look at the mobile usage report, and then choose a custom dimension for b2b customers vs b2c customers, you can see which personas use which devices more often. Last week Google rolled out a brand new report to give users insights into how their paid and natural campaigns impact each other. The report combines information already available in Adwords with information from your Webmaster tools, to give you a holistic view of your performance on the search engine in one place. and most interestingly, when organic and paid listings were shown at the same time. Since this report is using WMT information, you need to link your webmaster tools account with your Adwords, to enable this functionality. Note that the report will only show data from the point it was linked onwards, it will not show historical data. Note also that if you link more than one domain, you will not be able to distinguish that traffic by domain in this report. On the release of this report, Google heavily suggested that you use the information from your organic listings to add new keywords to your Adwords account. For example, you might see which organic keywords aren’t being shown with ads, and maybe add those to your Adwords campaigns to get even more volume. Certainly, if you are trying to improve reach and volume, this is something you could consider (as long as those terms are bringing valuable traffic in organic). Having said that, not everyone wants to just keep increasing volumes. Many businesses have limited budgets, and when those budgets are exhausted, they might want to know where they can economise. They can use this report to see where their campaigns are overlapping, and consider removing ads where their organic listings are very strong. Whether you use this report to add more volume, or reign in the costs, whenever you make changes you should monitor this report to check the impact of your paid ads on your organic listings.